'In an inflationary world, a toll bridge would be a great thing to own because you've laid out the capital costs. You built it in old dollars, and you don't have to keep replacing it.' - Warren Buffett. While he is using 'toll bridge' as a metaphor, what Buffett fancies is an unregulated, monopoly kind of business, which is critical to its users. A product or service that is used often. And every time it is used, it generates income (toll revenues) for the owner. By the virtue of high 'traffic', the income is high, much higher than the expenses needed to maintain the asset (the bridge). Now each highlighted word is critical here. Ignore even one, and the 'bridge' collapses. That's what happened to Noida Toll Bridge Corporation Ltd (NTBCL). We recommended the stock in 2010. The firm operated a 552.5-meter long eight-lane bridge (known as the DND Flyway) that connects South Delhi to Noida. NTBCL generated revenues through levy of toll charges for use of the bridge by commuters. The bridge (DND flyway) started operations in 2001. Using the bridge saved time, distance and fuel consumption. Therefore, it had stickiness. And users did come in great numbers. The traffic had grown from 17,000 vehicles per day in March 2001 to almost 110,000 at the time of recommendation, and was likely to go up. The company was generating free cash flows. The bridge was operating at just 50% of its capacity. As such, the scope of growth was high. And it did not need further capex. The company had the flexibility to raise toll charges to account for inflation. And as per the concession agreement with Noida Authority (NOIDA), until the bridge reached full capacity or for the next 10 years (whichever was later), a new bridge would not be built. This implied monopoly for a long time. The concession agreement also allowed the company the right to collect user fees to recover the total cost of the project along with 20% per annum return. It was almost a guarantee. The contract offered extension in concession period until such returns were made. Any shortfall in such return was to be added to the cost. The total cost of the project, which qualified for an assured return of 20% per annum, included shortfalls in the previous years. NTBCL seemed to fit the bill of a great 'toll bridge' kind of business. Yet, we closed (exited) the position in 2015 with 19% losses. The stock has fallen by 61% since then. The business started showing signs of regulation. Every time the company tried to hike the toll, there were strikes by the activists of Janhit Morcha and workers of a certain political party on bridge. Amid the demand to make it toll free, there were allegations of corrupt practices by the flyway operator. The Planning Commission then conducted a case study. It stated that the agreement was against the public interest and suggested to change the terms of agreement. The flyway was declared toll free. Amid all this adverse news, the stock crashed. So much so that the dividend yield on this price amounted to 12%. It did not help that the company was about to become debt free by the end of that year. We underestimated the risk of regulation. And our entire investment thesis fell apart. What We Learnt in the Process? Since then, we have been extremely wary of businesses that are shadowed by regulations. Mostly, we avoid such stocks. In rare cases when we recommend a company that may face such risks, we make sure valuations factor in the downside and things that could go wrong. GMDC, a company that operates in a highly regulated mining sector, is a case in point where we made 61% returns in 10 months. Anyway, the reason I shared this failure story with you today is because next week I'm meeting a company that enjoys 'toll bridge' economics in the truest sense. What more, this company is also a proxy bet on one India's fastest growing segments. Will it make the cut for my next recommendation? My upcoming Hidden Treasure recommendation will answer that. Products/services of the proxy industry must be critical to the main industry and not discretionary. Proxy industry must have favourable cost structure, strong balance sheet and bargaining power. Growth and profitability of the Proxy industry should depend on output of the main industry and not its profitability. Proxy industry must have a fairly diversified client-base to avoid concentration risk. 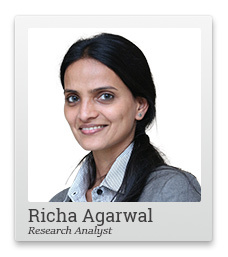 PS: With Richa's unique approach to small cap investing, you can make the most of the small cap correction - this is a once in a lifetime opportunity that could change your wealth. Subscribe here. Equitymaster requests your view! Post a comment on "One of My Worst Investing Mistakes, And What You Can Learn From It". Click here! 1 Responses to "One of My Worst Investing Mistakes, And What You Can Learn From It"
Investment in small mudcaps is not for the faint hearted. 2. Could a public listed company like NTBCL defraud public / abrogade agmt and cheat it's partners namely Delhi govt, Noida authority? If it did it would be open to severe penalties / action for such acts. 3. Why has ntcbl filed arbitration claims against Noida authority for Rs 7000 cr plus? 4. Who has motivated the present situation? Is it politicians who want to corner the land around ntcbl? Is the Noida authority facilitating this thru deliberate abstinence? Recall the 20 pct IRR if not achieved can be made up by NTBCL selling this land. Recall ntcbl has filed arbitration claim of Rs 7000 cr plus on grounds that Noida authority has failed to maintain peaceful posession po the asset with the operator in order to carry on its enterprise? The supreme Court has mandated the CAG to submit as to whether the operator has recovered the full cost plus returns as per the agreement. The supreme Court has also said whilst not granting stay to NTBCL of Allahabad high Court order that if it is found that NTBCL has not recovered it's cost then it could always seek extension of concession to recover toll. If CAG findings are in favor of NTBCL then does the stock become a screaming buy at this price? We shall know this month when supreme Court pronounced it's verdict.